We’re back from a brief hiatus. I understand some of you even missed us. The last three weeks have been something of a blur. October 28 was Shannon’s third chemo treatment, and things in that department just continue getting better. We survived the sudden blizzard that showed up the day before. Shannon’s been working from home since then, due to low white blood cell counts. We’re hoping for a little more predictability for Round Four. She hates being a hermit. 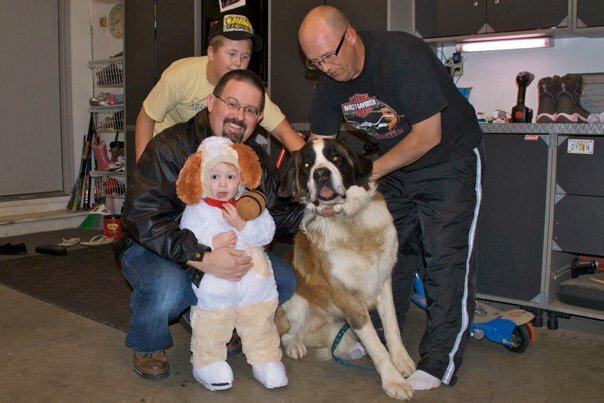 Carter was a St. Bernard for Halloween. There’s a St. Bernard named Max at our neighbor’s house, and Carter just loves him. Getting those two together was just too darn cute, as you can plainly see. He was a great trick or greater, going door to door in the neighborhood. 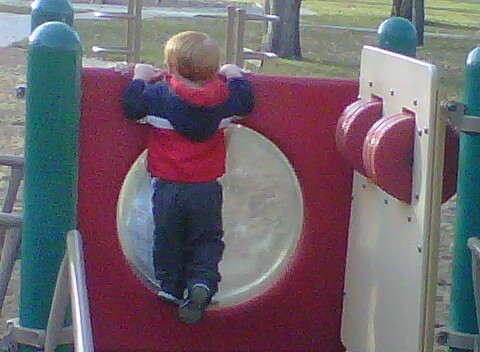 He knocked on doors, peered into houses, and screamed in excitement at all of the other kids. He made quite the haul, but Daddy got his Pixi sticks. 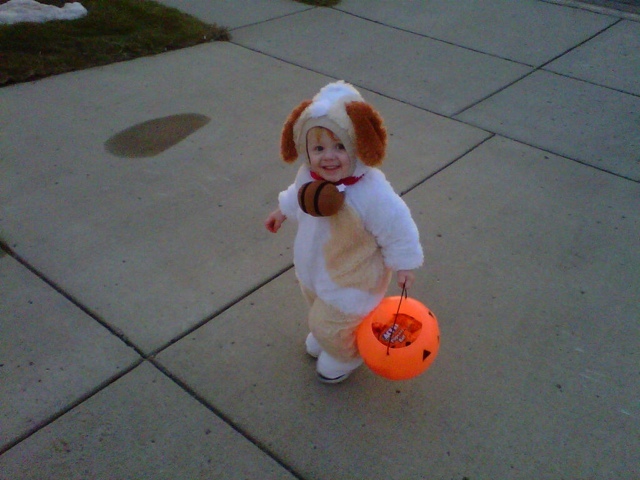 He had the best time at home, though, running to the door every time the bell rang to help pass out candy. Grandma says he takes after his father, who was 5 before he realized the point of Halloween is getting candy, not giving it away. The next few days brought a trifecta of craziness. It was Basin Electric Power Cooperative‘s annual meeting, which meant long days and equally long nights, with receptions, meetings, and hundreds of attendees. I spent most of the week out of the office working. Grandma was here to help Shannon take care of Carter, which was a huge load off my mind. Senator Byron Dorgan gave the keynote at our banquet Wednesday. Tuesday November 2 was Shannon’s birthday, a fairly low key event. We’re planning a huge “after-chemo extravaganza” in lieu of a party this year. It was also Election Day, and as Basin Electric’s official political guru, I was up way past my bedtime analyzing the returns for my boss. I blame Alaska. For the third straight election cycle, I predicted the outcome in the Senate races. I fell about two dozen seats short of predicting the House changes, but 5 and 1 is still a winning percentage, I guess. I’m not much of a surfer, so waves have always puzzled me. Shannon’s Dad and Stepmom came up from Rapid City this last weekend. Patty is a regional breast cancer patient navigator at the hospital down there. Getting her perspective on things has bee a huge help to Shannon’s demeanor. We had spectacularly warm weather all weekend. It wasn’t so good for the deer season opener, but was just right for spending a few hours with Carter and his grandparents at the park playing. Things have finally settled down for the rest of the week, I think. Round Four is set for November 18, assuming her blood work is up to snuff. In all, we’ve got a pretty good routine going, and seem to be managing OK. Our thanks to everyone for keeping us in your thoughts and for all of your support. It really has helped us learn to relax. p.s. You now have two ways to enjoy my ramblings: in print and audio form. You may remember my guest spot on the Red Wild Show on URL Radio from a few weeks back. I’m back on the show this week, but is time I’ve been made a full time co-host. It’s very exciting and disturbing at the same time. Exciting because it’s new and I get to talk about two of my favorite subjects, technology and photography. And disturbing because they actually think having me on the show is a good idea. So, dear readers, be warned.